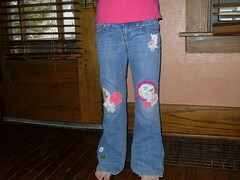 I patched a pair of Trinity pants last night. It's hard to find stuff that fits right...she's really hippy. (these are Old Navy) I have another pair doesn't have holes yet but she wants me to do.